Sometime in the seventies, Jacques Arpels had a totally novel idea, to design and market the first jeweller's fragrance. Perfumes enhance feminine beauty and seduction. Not unlike jewels, perfumes are an ornament, invisible and yet overwhelming. 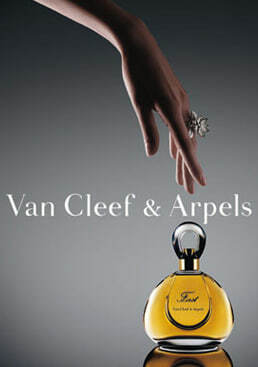 This was the idea of Van Cleef & Arpels First, created in 1976. A Floral Aldehyde, because it relies on only the prime choice of noble components and on white flowers, the most luxurious and seductive of all components. First's fragrance remains the day it was created. A tribute to Femininity. Shrouded in mystery and sophisticated, it conveys a feeling of exclusiveness.